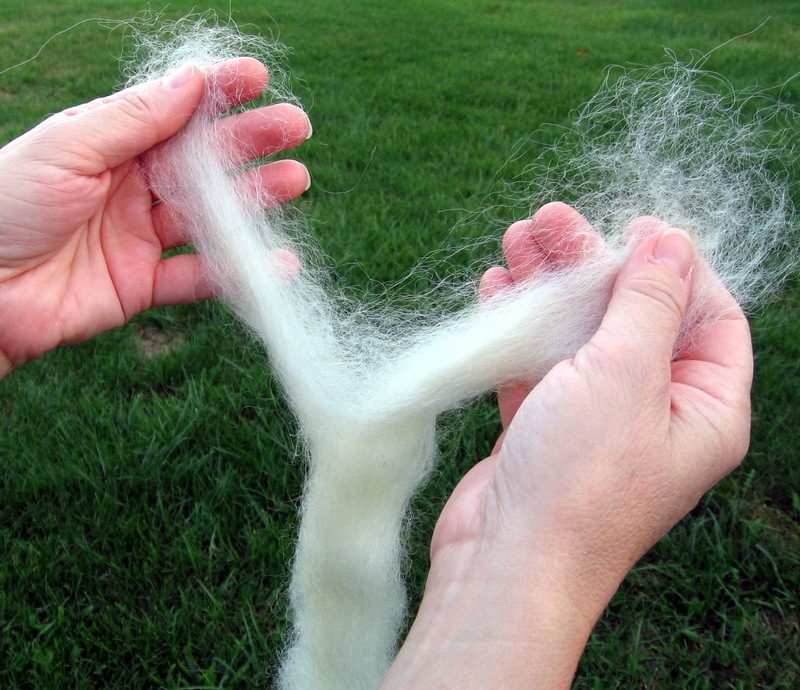 Roving is the clean and combed wool from a fiber-bearing animal. It is usually a long fluffy “rope” that is several inches in diameter. I often use wool roving that comes from the fleece of a Corriedale sheep. It has a creamy light vanilla color and soft spongy texture that is easy to hook, especially for those who have never used roving before. However, bear in mind that various sheep fleeces will produce different textures of roving, so have fun and try some other types too! · Grasp this smaller half piece of roving in both hands, with your hands about 6 inches apart. Gently pull with your two hands so that you can feel the fibers just begin to pull apart but do not separate the fiber. Reposition your hands farther down the roving and repeat. This will gently open up the fibers so the roving will be a little fluffier and easier to hook (if you are a spinner, you will recognize this procedure as “pre-drafting.”) “The pre-drafted” piece will be about the diameter of a Sharpie marker. You can also use strips of roving about the diameter of a pencil. The size of your hooked loops will depend upon the diameter of your roving strip. Thus, thinner strips will yield smaller, finer loops and thicker strips will yield larger, bulkier loops. If you accidentally pull the roving apart while you are pre-drafting it, just set aside the smaller piece and hook with it later. · Now you are ready to hook with roving! Hooking with roving is done in much the same way as if you were to hook with a wide cut fabric strip. · You must always use a primitive hook so you are less likely to split the fibers when pulling up your loops. I like to use my 8mm Hartman Hook. · Always bring your ends to the top of your work and trim even. · When you end your roving strip, begin a new piece in the same opening, just as you would do for a fabric strip. · Each time you pull up a loop of roving, roll your hook toward the previous loop. This will help keep you from pulling out the previous loop. · Space your loops at least 2 to 3 threads apart. Don’t worry if the loops are not perfectly even. Don’t pack your loops. · Outline your design and then fill it in. · For best results, pull up your roving loops a little higher than the rest of your hooking. If you are combining roving with your regular hooking, it is best to hook all appropriate areas with the wool strips first. Hook your strips just outside the shape you want to fill with roving, leaving an opening for the roving. Once you are finished, steam your rug, and then hook your roving last. You want to prevent exposure from the prickle strips of your rug hooking frame, which would tear against the roving and accidentally pull it out. You also want to keep the roving-hooked area away from heat and steam as this can cause felting and matting of the roving. Sheep curls and locks make a wonderful embellishment to your rug hooking! They are also easy to hook. They are fine enough to pull up in between hooked rows of wool strips or roving. Using a primitive hook gives the best results. Pull up one end of the sheep’s curl so that the end hangs out about ¾” to 1 inch high. Now hook a loop but pull it up so it forms a large high loop and do not pull out the end. Proceed in this same manner until you get to the end of the curl, then pull up the other end so that it hangs out about ¾” to 1 inch. Continue with another sheep’s curl, pulling up the end in the same opening where the previous curl ended. Usually “less is more” in this situation since it doesn’t take a lot of individual locks to make a dense area of lush curls. When finishing your piece, take particular care not to steam or press over areas embellished with the curls. Do you need ideas or suggestions for using sheep curls? Think of witch’s hair, wooly sheep, slender flower tendrils, feathers, and Santa’s beards! (c) 2010 Kris Miller/Spruce Ridge Studios LLC. All rights reserved. The written content, designs, graphics and images on this blog site are copyrighted and may not be used in any form or by any means without written permission of the artist.